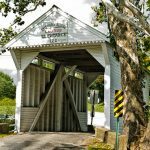 There are three covered bridges in Pennsylvania known by the name Jackson’s Mill Bridge. This particular Jackson’s Mill Covered Bridge spans Octoraro Creek in Bart Township, Lancaster County, Pennsylvania. The other two are in Bedford County and Washington County. 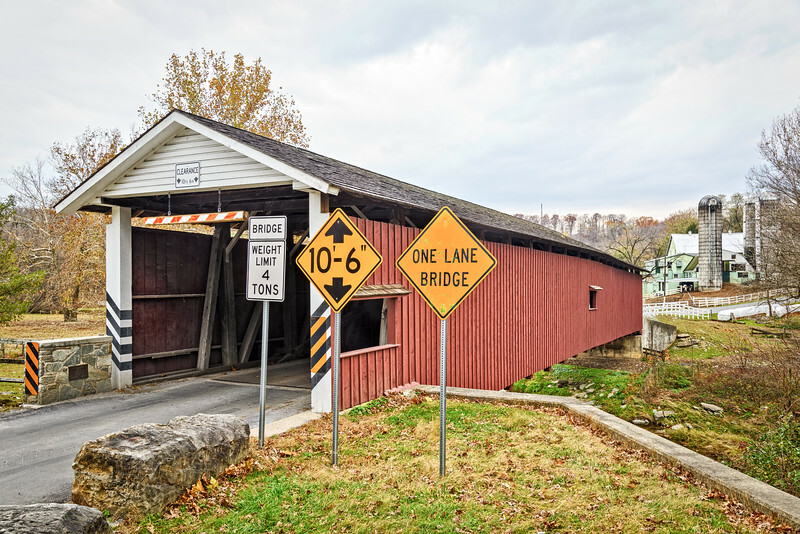 Just to add to the confusion, this Jackson’s Mill Covered Bridge also goes by two other names: Eichelberger’s Covered Bridge and West Octoraro #1 Bridge, which is its official designation. 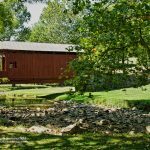 Sometimes you will also see name the as Jackson’s Sawmill Covered Bridge. Talk about confusing! The original bridge was built in 1878 by John Smith and Samuel Stauffer at a cost of $2,410. 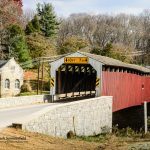 It is a double Burr arch truss design, a fairly typical design in Lancaster County. What is unusual is that this is the only covered bridge in the county that does not lie straight across the creek it crosses. When the bridge was built there was a saw mill located on one side of the waterway and a large rock formation on the other bank. These elements forced the builders to place the bridge on a diagonal. 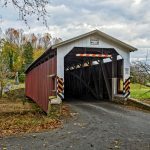 This is said to be one of the most attractive covered bridges in Lancaster County. 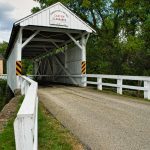 However, being on very lightly traveled farm roads it is reportedly seen by fewer people than any other covered bridge in the county. With the open land to the west of the bridge and the farm on the north side making great backdrops to the bridge, I encourage any of you in the area to find this particular covered bridge. Even on a cold cloudy November day the bridge proved to be a worthy subject for my camera.